SRINAGAR, India (AP) — Tens of thousands of angry protesters poured into the streets more than a dozen times in Indian-controlled Kashmir on Monday, hurling rocks and shouting anti-India slogans after soldiers killed four civilians and two suspected militants. Government forces responded with tear gas. The overnight shooting at a military checkpoint threatened to spark even more unrest in a region that in recent years has seen renewed rebel attacks and repeated public protests against Indian rule. The authorities had put parts of the highly militarized region under lockdown after the late Sunday night shooting, deploying soldiers and riot police, shutting schools and internet service and ordering people off the streets in some places in an attempt to derail protests. Many protests centered around the town of Shopian, where the shooting occurred, a region of mountain forests and apple orchards. There were no immediate reports of injuries from the protests. The trouble began late Sunday night, when officials say a car refused to stop at a checkpoint outside a Shopian military base and militants inside fired at the soldiers. Indian army spokesman Col. Rajesh Kalia said a rebel and three civilians were killed when soldiers fired back. A fourth civilian's body was recovered from a nearby car, officials said, and the body of another rebel was found a few kilometers (miles) away. Authorities said he was injured in the shooting and died later. Kalia called the slain civilians "over-ground workers," a term that Indian security forces use for people who give support to the rebels. Police, though, were careful not to use that term, calling them simply "young men" and saying they were investigating the incident. However, Kashmir's top elected official, Chief Minister Mehbooba Mufti, termed them "civilians." In a tweet, Mufti said she was "deeply distressed by more deaths of civilians caught in the crossfire in Shopian." But across the region, most people believed all were killed in cold blood. The soldiers "shoot even at shadows, and they're employing every tactic to suppress people," said Bashir Ahmed, a Shopian resident. Separatists challenging Indian sovereignty over Kashmir called for a strike after the shooting, and shops and businesses slammed shut across the region. Top separatist leader Mirwaiz Umar Farooq called the army's version "propaganda and lies" and said the soldiers had "let loose mayhem" at Shopian. Authorities cut cellphone internet service in the most restive towns, and reduced connection speeds in other parts of the Kashmir Valley, a common government practice to calm tensions and prevent anti-India demonstrations from being organized. Officials also ordered schools and colleges closed until Wednesday and suspended rail service in the region. 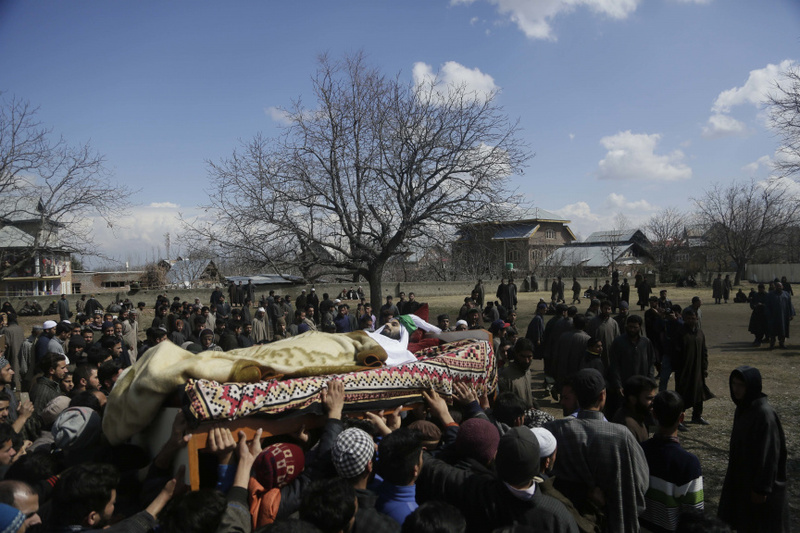 At one of the funerals for the dead rebels, soldiers fired in the air to disperse thousands of mourners in a village in the Shopian area. No one was reported injured. Indian troops are covered by controversial powers that shield them from prosecution while serving in Indian-controlled Kashmir. Under the Armed Forces Special Powers Act, army and paramilitary officers can search homes and make arrests without warrants, shoot at people suspected of being separatists and blow up buildings or homes on suspicion that insurgents are using them. Rights activists accuse Indian troops in Kashmir of routinely misusing their power, killing civilians in staged confrontations for promotions or rewards and to suppress public sentiment against Indian rule. Rebels have been fighting Indian rule since 1989, demanding Kashmir be made part of Pakistan or become an independent country. India accuses Pakistan of arming and training the rebels, a charge Pakistan denies. Nearly 70,000 people have been killed in the uprising and the ensuing Indian military crackdown.